Dazzling and Blinding explores a musical experience with a visual experience. In this video piece there was a wish to communicate music qualities with a dynamic unfolding of visuals - a matching of music with visuals. The artistic emphasis was on colour, motif and moving art. The movement in the images matching some of the timbral qualities in the music. Visual motifs and music motif entwined. The suggestion of primal darkness, movement and temporal evolution were the ideas behind the visual work. In this visual music exploration, no absolute scientific connection is sought rather the emphasis is to explore intuitively an aesthetic relationship between the music and visuals. 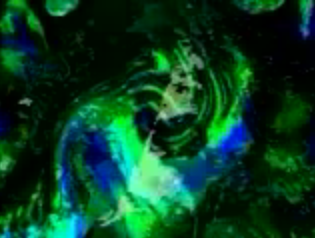 The music was used to inspire the creation of dynamic and temporal visuals. The visuals becoming music, they take on board the music qualities of movement, tone, motif and timbre used in music composition and yet create their own dynamic language. Source Visuals This video piece was created for the web. Source footage was taken from the web - web video clips and still images, manipulated beyond recognition. The function of the source footage was to create dynamic material that could merge with the dynamic rhythmic and movement qualities in a chosen piece of music. Music An extract was chosen from a music composition by Kaija Saariaho. The piece is called Verblendungen from her CD "A Potrait of Kaija Saariaho"
The attraction of her music is its use of pattern, timbre and rhythm and exquisite form. Emotionally the piece had a primal feel to it, suggestive of darkness, light, evolution, movement. This extract became the focus for the visuals. After I had finished the piece I read the translation of the title of the piece to be a process of being dazzled and blinded."